The Sterling (aka Nova) kit car was first produced in the UK by Richard Oakes and Phil Sayers using a swoopy fiberglass body, and Volkswagen Beetle chassis with buyer provided running gear, but the story didn't end with them. Several entrepreneurs later and the same basic shape/molds were used by Joe Palumbo who started Amore Cars in Milwaukee, building something called the Cimbria SS. 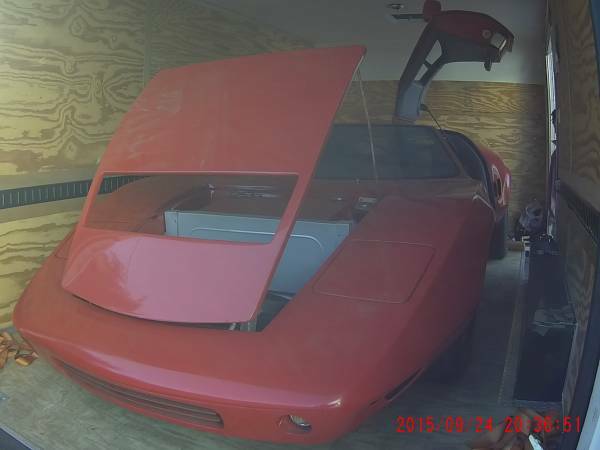 Find this 1983 Cimbria SS Kit Car by Amore offered for $12,000 in Santa Barbara, CA via craigslist. Tip from Rod444. The seller calls this car a Cimbria by Neira, but internet sources conflict on if the Neira (or Neiera) was a renamed Cimbria or assembled by another builder altogether. 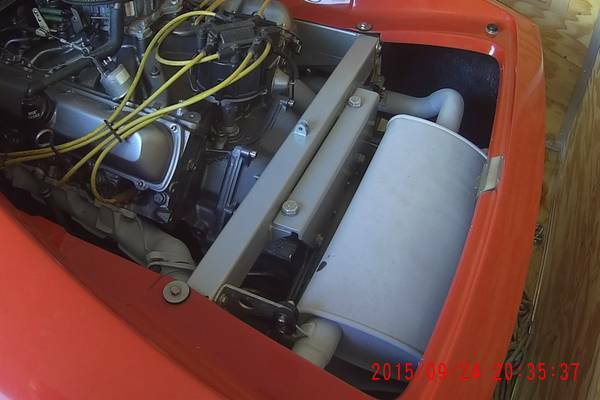 However, it does appear that the 1983 VIN would put this in the timeframe of the Cimbria SS built by Amore Cars. But, this car looks to have a tubular frame instead of a Beetle donor pan, so it could be something one-off. Here is a Cimbria SS brochure from nationalsterling.org. The seller includes a few blurry pictures of older pictures of the car when it was driving around, but the recent photos look to have been taken inside of an enclosed car trailer. It looks in good shape all things considered, and could be a blast to drive even with the slushbox. Under the rear hatch is a 455 cubic inch (Chevy, Oldsmobile, Cadillac?) V8 that appears mated to an automatic transaxle -- this could be an entire assembly from an Oldsmobile Toronado...perhaps someone reading this can enlighten everyone in the comments. It'd be nice to see a bunch more photo's to get a feel for what it really looks like. The front end seems low, and is likely adjustable, however, I wonder why there is only 13 miles on it. Was it never sorted properly? Or are there fatal flaws? I imagine, looking at some of the quality componentry and a nice fit and finish inside, that it would be a really nice ride, especially with that 455! Being 1983, having no bumpers or marker lights may create issues with registrations in many areas. The attached CL ad shows many pictures, but one picture in this case is all you might need, or one too many? The pastiche "design" and homemade frame (all the others, <10) were on VW frame it says, conspire to suggest the real value would be to sell tickets to next Spring's Volunteer Fireman Jamboree and cook-out where whacks with a sledge hammer would cost $20 a piece. I am in! I would imagine many of those 13 miles were done quite slowly after the front end got wicked light and the driver lost control of various bodily functions. Phase II production did not fix the lack of contact between the front tires and the tarmac, but the interior was made from materials that could be safely hosed out, or so goes Cimbria SS Owner's Club lore. It is a rear engine car, I have one. The olds tornado is in correctly, with the engine facing forward to the firewall which is located just behind the seats of the driver and passenger seats. The exhaust you see is up in front of the rear panel of the car, just behind the transaxel. So it is "set up" to go the right way. Know your car's layout and design along with motor and transmission or transaxels as in this case before you make goofy "20 mph max" comments. Reference to one from long ago, Mid-Engineering Olds Tornado chassis, Bill Porfield or Car and Driver magazine cover with 1g on skid pad as the title where such chassis under a Kelmark body did 203mph. Late seventies or early eighties magazine cover for C&D. Wouldn't be to surprised if a Mid-Engineering Olds V8 chassis is exactly what sits beneath this Cimbria SS. I have the Mid-Engineering Transverse V6 rear engine chassis under my Aztec 7 down in the garage. Making modifications to a copied chassis I am having built to hold a Transverse V8 setup for my April 2016 purchase of a Cimbria SS body. Kent, Bigfork, Montana. I bought this beast and you were dead on Ken. You are paying for a swoopy fiberglas body with a hot mess underneath. 13 miles, I know what this means. Something happened on the test drive years ago that made the drive sh#t their pants.